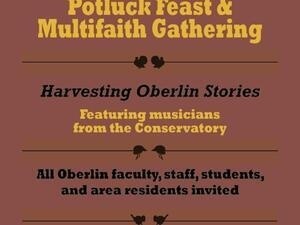 Oberlin community members are invited to enjoy an early Thanksgiving meal at the annual Thanksgiving Potluck Feast and Multifaith Gathering. Faculty, staff, and area residents are asked to bring a dish to share; students, no dish necessary. Conservatory students will provide music. This year’s honorary hosts are Carol Lasser, Gary Kornblith, and Phyllis Yarber Hogan. Sponsored by the Oberlin Area of Cooperating Ministries, Interfaith Student Council and the Office of Religious and Spiritual Life.